Medicinal uses: The fruit is antiscorbutic, aperient, depurative, digestive, diuretic, laxative, refrigerant and sialagogue. The leaves contain the toxin hydrogen cyanide. A decoction of them is used externally to relieve rheumatic symptoms. As a poultice it can relieve sprains or reduce the pain of dislocations. Other uses: Red currants are often used to make jams and jellies as well as some sauces. They have a tart, sour flavor. A yellow dye is obtained from the leaves. A black dye is obtained from the fruit. 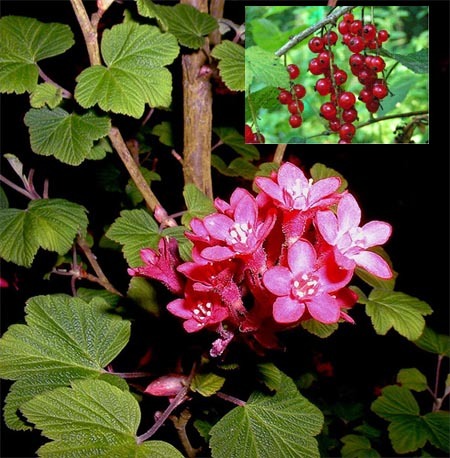 The fruit is used cosmetically in face-masks for firming up tired and lifeless skin (www.ibiblio.org/pfaf/cgi-bin/arr_html?Ribes+rubrum).